Clouds hanging from the ceiling give a feeling of being in the African Veldt. A beautiful, large Lion's head creates school pride. 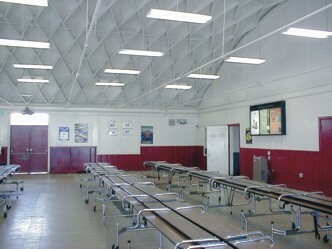 Before: A big old room with long institutional tables- as dull as dull can be- with lots of open trash cans. 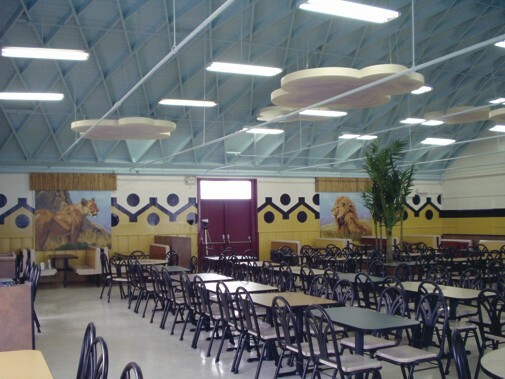 After: A safari/jungle theme dining room is created to highlight the Lion school mascot. An exciting wall paint design shows the safari motif (go to page 85 to see the huge lion head we placed on the wall to make this room special for students).